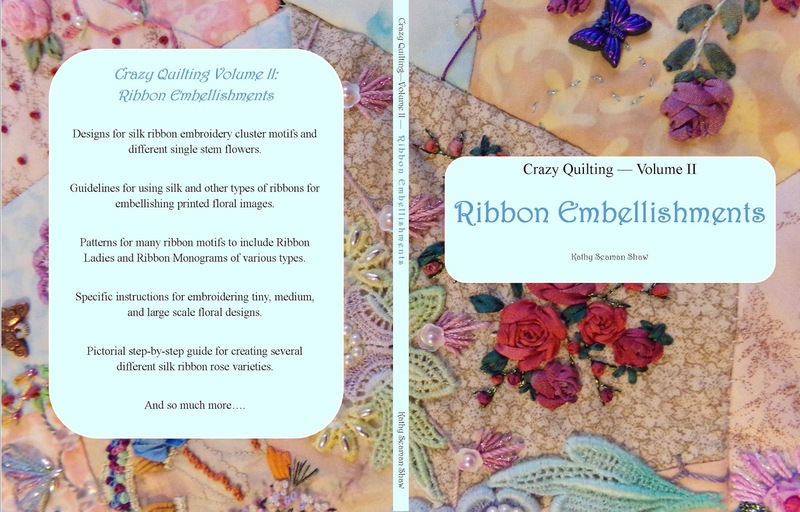 ``Shawkl``: Crazy Quilting Volume II - Ribbon Embellishments - taking pre orders on Etsy! 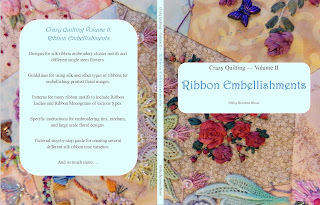 Crazy Quilting Volume II - Ribbon Embellishments - taking pre orders on Etsy! UPDATED 5/20/16: Amazon has indicated that they will launch in EARLY June rather than late June...yeah! Good morning everyone! 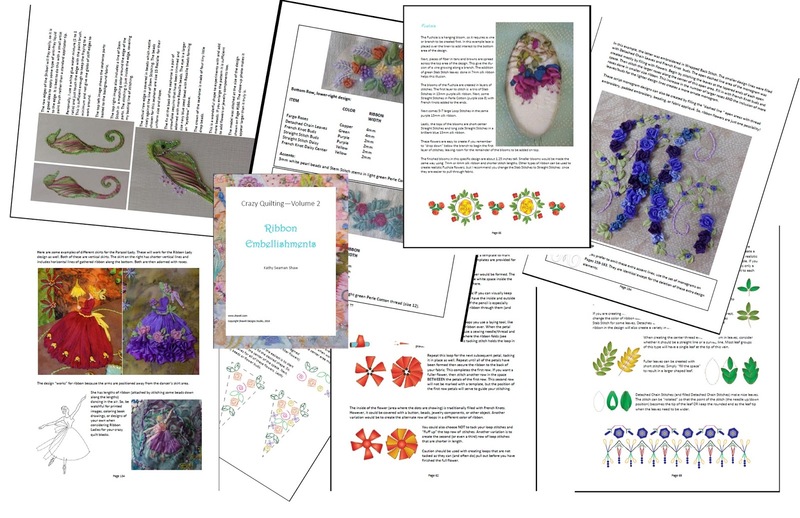 The Ribbon Embellishments book is in the final stages of publication! Mary has it for editing...and I expect to get her changes made next week. The printer has mailed me my first Proof Copy...so I can check the photo and layout. Then, changes will be made and the books can be printed for shipment to me! Want a peek at some of the pages? Seriously, I'm so excited...aren't they gorgeous in color! I've listed in on my Etsy shop for Pre-sales in the United States only, Sorry, the international sales will have be handled via email for now...so just send me a note and we can discuss...or you can wait just a bit longer and get a copy from Amazon.com International when the book launches in late June. Here is the draft cover artwork...which may change slightly. The book is over 160 pages and is packed just as full of diagrams, patterns, how-to instructions, and luscious color photographs! When I had "white space" at end of some sections...I decided to fill that in with color charts of some new seams! I'm so proud of this book...it is even better than the Basics Book and I dearly love that book! So, you can see that my joy is spilling over this morning! When the books arrive from the printer, I'll get them into the mail promptly. I've listed the book twice on my Etsy Shop...one is for PRIORITY MAIL costs for those that can wait even an extra few days...and the other is for MEDIA MAIL costs which is about $2 less, and will take about a week longer to arrive. Your choice of postage rates! The book is listed at 20% off the shelf cost ... as my thank-you to those that pre-order. Amazon will have the full price book available in Late June, don't have an exact date yet...but will let you all know that when I am informed. Hugs, to all! Am happy for you Kathy. Beautiful work...I'm thrilled for you. It looks great. I use the first book almost every time I pick up a needle.